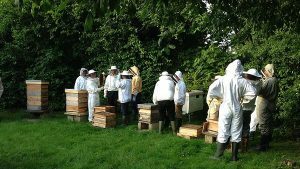 The Oxfordshire Beekee pers Association (OBKA) objectives are 'to further and promote the craft of beekeeping and to advance the education of the public in the importance of bees in the environment'. We provide an educational programme for the anyone interesting in becoming a beekeeper, including taster sessions, meetings and practical beginners courses. We also encourage our members to raise their standards through further qualifications, such the BBKA Basic Assessment in Beekeeping or Advanced BBKA husbandry courses and examinations. OBKA also provides practical information and assistance to the general public for the collection of honey bee swarms, and we are now actively drawing attention to the decline of pollinators and how we can help our environment. We run an annual Introduction to Beekeeping course - for more details please see the Teaching Apiary section. For those who are not quite sure if they want to start beekeeping we also run an Annual Taster Day.